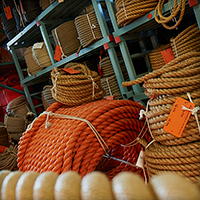 G. van der Lee Rope Factory products are made of various materials. Manila is the most frequently used among the materials but flax, sisal and hemp are still being processed into quality fibre rope products today. Well-known synthetic fibres like nylon, polyester and polypropylene have been preferred for many applications since the second half of last century. Their excellent breaking strength is the main reason for this. And, in the past few decades, superfibres with even more impressive properties have become available.